Editorial Note: I stumbled on a few “Ask Me Anything” questions I got a few months ago and had completely forgotten about. Over the next week or two, I’ll do my best to work them in to the schedule. That’s not as straightforward a question as it might seem at first glance. To cover the basics, I’ve got two formal ebooks published under my own name. The first, Nobody Told Me: The Cynic’s Guide for New Employees, is my treatise on what it means to be a youngish employee in the bowels of a giant bureaucracy. It’s still one of my favorite efforts to date. 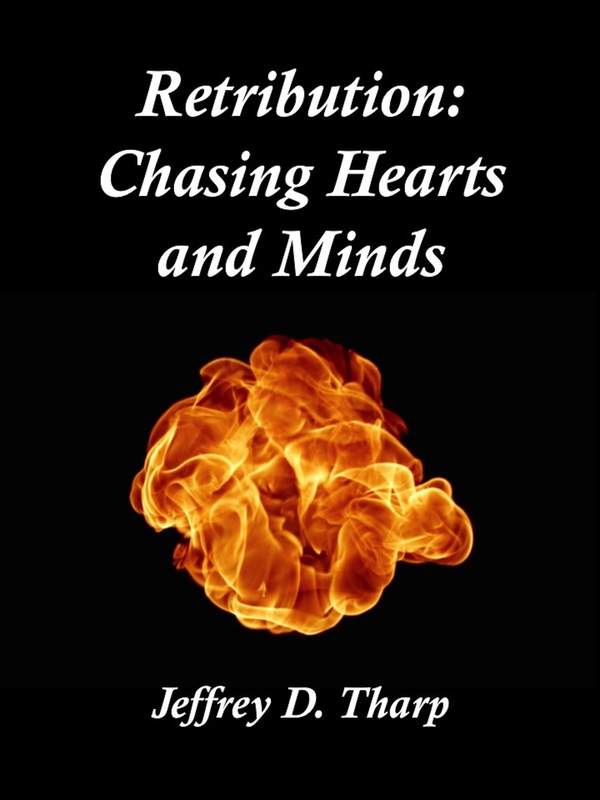 The other primary ebook I have up for sale is Retribution: Chasing Hearts and Minds. That’s my first foray into proper fiction – and one that I hope gets a follow-up sooner rather than later. I’ve actually got that next installment “sort of” outlined, but haven’t forced myself to sit down and do the hard work of putting words on paper. I’ve also done a bit of short story writing under a pen name that, for the time being, is not a topic for public discussion. Writing under a name other than your own is a remarkably freeing experience and lets you dive into topics and ideas that you wouldn’t otherwise explore. I’ve made a conscious decision to largely keep me and my alter ego completely separate for purposes of discussing what I write about on a regular basis. Although I’m not ready to drop that veil just yet, for purposes of answering this AMA, I’m including the sales totals from these 15 or so other short stories. I try to be “platform agnostic” when it comes to sales. I’m happy using Amazon, Barnes & Noble, Apple, Smashwords, and a dozen or more other small e-retailers. Without making this post into an enormous spreadsheet of sales figures, between all my titles and across all print and electronic platforms I’ve had 1905 total sales and earned near enough to $1,450 in royalties. That’s not setting the world on fire in the publishing business, but I’m proud of those numbers because it’s something I carried through every step of the creative process and convinced people to pay real money for. It’s a deeply satisfying experience. When it comes to price, I keep it simple. For ebook buyers short stories go for $.99 and the longer works for $2.99. Paperback copies come in at $7.99. Those are pretty much the lowest prices allowed by the retailers unless you’re running a giveaway promotion. I realize that I’m competing against a host of people who have jumped into the epublishing world over the last five years. My logic there is that I don’t have a built in audience and can’t expect anyone to pick up something I write over any of the thousands of other “no name” competitors. I never wanted price point to be the factor that sent someone over to the next guy to find a bargain. I’d love to spend a little time talking about what might be next, but the reality is I’ve got seven different files sitting on my desktop right now in various stages of development. One is ready for final editing. Most are somewhere between notes or rough outlines and fully fleshed out written chapters. Some are “mine” some belong to my alter ego. What I work on largely depends on my mood. It’s not exactly an efficient way to operate. It might not even be an effective way to operate. Fortunately, since I’m doing this more as a way to blow off stress and be creative, the need to be effective or efficient isn’t exactly a driving force. I love writing and get a real charge out of seeing someone pay money to read something I’ve come up with. At heart, though, I still mostly identify as a half-assed blogger so it’s safe to assume that the lion’s share of the day’s word count is going to keep pouring out on these pages for the world to see at no additional charge. This will be old news for anyone following along my “official” Facebook page (because they get breaking news a day early), but in the interest of getting the word out to as broad an audience as I can muster I’m going to post my Christmas Freebie here too… mostly because it’s my blog and I can do what I want. From now until the end of the year, you, your friends, family, father’s brother’s nephew’s cousin’s former roommate, whoever, can get your very one copy of Retribution: Chasing Hearts and Minds at absolutely no cost. Well, no cost except for the opportunity cost of the time you spend going over to Smashwords, signing in, adding the book to your cart, applying the coupon code, and then checking out. Yes, aside from that, your copy is absolutely 100% free. Many people aren’t as familiar with Smashwords as they are Amazon, Barnes & Noble, or Apple, but I can tell you it’s a great place to find some writers who won’t get a lot of play from the big e-publishers. Think of them as the small, local coffee shop of e-book retailers. They’re doing good work and I think you should support them when you can. In any case, to get your free e-book from yours truly, just click over to my Smashwords page, add Retribution to your cart, enter Coupon Code: KY37R when you check out, and you’ll be all set to download your copy in the reader format of your choice… and if you want to leave a review or even just a comment, feel free to go ahead and do that too. If you’re feeling especially generous, give this post a “like” or even share it on social media… Think of it as a gift for all your friends who might enjoy a little fire and brimstone with the Christmas celebration. I’m not an ad man. Marketing is the very last thing in the world I would turn my considerable brain power towards. I’m just not that interested in begging and pestering people into doing things. Being a cynic by nature and long habit, I’m always a little skeptical of what people who do marketing for a living tell me. Actually that’s not true. I have a tendency not to believe any words that slither past their forked tongues. I just assume they know that’s an occupational hazard of being professional liars. How I know you’re not a very reputable (or at least a very good) marketing firm is when you call my mother trying to reach me to discuss “exiting opportunities for marketing your book.” I lived at the old homestead long enough that I’m sure my name will forever show up in the public records next to a phone number where you haven’t been able to regularly reach me since 1998. However, there are surely plenty of other bits of information in that same public record that indicate that hasn’t been my phone number in quite some time. I’d expect even a half-assed marketing firm to be able to noggin that out for themselves before picking up the receiver. I’m not going to call out this company by name, because I won’t give them the benefit of even the barest level of free publicity for themselves and whatever scam they happen to be running this week. Suffice to say I’m not interested. I might have at least been willing to look at options if they had availed themselves of any of the 647 other ways to get in touch with me, but since they opted for the easy and obviously wrong approach, I’m afraid they don’t even rate sufficiently to justify a personal rejection. Although I appreciate your contacting the Jeffrey Tharp Childhood Home, Library, and Gift Shop, it’s not owned and operated by complete effing morons so I’m afraid you’ll have to go out and find yourselves a more gullible mark. Retribution: Chasing Hearts and Minds has been out there in the wild for a little over a week now. I know from a few private messages and from the retailer’s weekly reports that a few copies are floating around. The individual feedback has been overwhelmingly positive – and trust me I never get tired of hearing good things about myself so I thank all of you who have taken the time to drop me a note. I do, however, have one small favor to ask of those of you who have already purchased your own copy (and those of you who plan to purchase your copy in the future). It would be incredibly helpful for me if you’d go back to your retailer’s page and leave a review. I’d never presume to tell you what kind of feedback to give – either positive or negative – but as I’ve learned the hard way, when it comes to selling ebooks, nothing gets a no-name work noticed like good reviews and ratings. In addition to total sales numbers, reviews are a big part of the secret algorithms the big retailers use to decide what moves up the rankings, what gets featured, and what doesn’t. Retribution will probably never make it to Amazon’s top ten in ebooks > sci-fi > dystopian, but if someone were to happen across it using a key word search, a few reviews could really help make the difference between picking up their own copy and moving on to the next alternative. Once you’re there, I’m sure you can figure out what to do without any more prodding from me. Now go forth and say great things! So, we’ve got the cover, we’ve got the narrative, and we’ve got the sales blurb. That means it’s time to race over to Amazon and get this thing published, right? Well, the answer there is more of a “sort of” than a yes or no. I’m not ready to pull the trigger today, but as always I have a roadmap laid out in my head of what I think the way ahead looks like for Retribution. Sometime between tonight and Friday I’m going to load it onto my Kindle and read the thing from cover to cover one last time. I’ve discovered through a lot of trial and error that just because you think you followed all the formatting rules for e-readers, there’s a pretty good chance that you screwed something up. Unfortunately that mostly shows once you have things loaded onto the actual device itself. Yet another of the minor pitfalls and annoyances of self publishing that in the end will be worth the trouble. Fixing those will be the main event for this weekend. Sunday, if all goes according to plan, is going to be the great day of reckoning. That’s when I’ll sit down in the morning and start uploading the final product to the retailers. I’m going to work primarily through Amazon and Barnes & Noble, but also fall in on Smashwords to get access to their own storefront as well as take advantage of their “special relationship” with Apple’s iBooks. By the time everyone’s long weekend is ending, Retribution: Chasing Heart’s and Minds should be going live. That’s the roadmap, anyway. How close that comes to reality remains to be seen. In the universe of the bureaucratic underling, few things are more highly sought after than a cubicle next to a window. Generally assigned based on seniority in rank or time in service, it’s one of the small things that can make a cube feel less like a 5×8 coffin and more like an actual productive work area. Sometimes, of course, appearances are deceiving. When you show up in a new office and there’s a prime window seat with your name on it, tread carefully. In any normal office, this seat would have been fought over and allocated long before you showed up. If it’s sitting empty, consider it a warning sign… Like the beautiful house on the tree lined street never quite seems to stay sold, there’s a fair chance this cube has problems. Someone might have died there in harness and it’s haunted or at a minimum it’s cursed by one or more of the myriad problems that tend plague a cubicle and all those who dwell in them. If there’s any good news to be had it’s that not much in life is permanent. You’ll probably get a chance to move into something more attuned to your needs (eventually). Of course you’ll be leaving behind the window, but if a career in service has taught me anything, it’s that windows are easy enough to come by, but you only get a finite amount of sanity to shepherd you through 30+ years of toil. If you ever had to pick between the window and some sanity, it’s what you’d call no contest. For more helpful tips someone really should have mentioned before letting you go to work as an office drone, don’t forget to get your very own copy of Nobody Told Me: The Cynic’s Guide for New Employees. Jeffreytharp.com is pleased to announce the arrival of a a bouncing baby book. 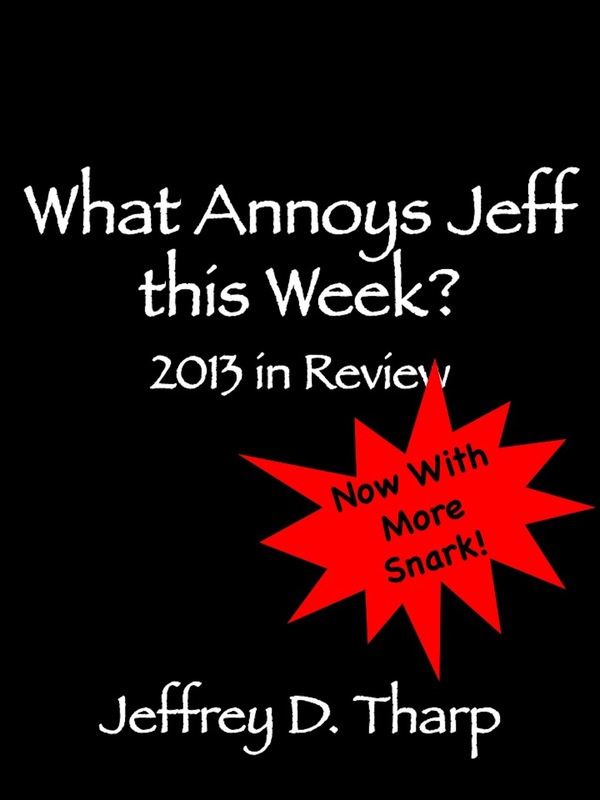 What Annoys Jeff this Week: 2013 in Review was published in the pre-dawn hours of December 30th and weighs in at 458 KB and approximately 79 pages long. It’s now available through Amazon, Barnes & Noble, and Smashwords for the low, low price of $.99. It’s said that those who don’t study history are doomed to repeat it. After two full years of writing WAJTW, I’m beginning to get an unsettled feeling that there’s nothing to be done against the rising tide of stupid people, awkward situations, and the the general sense that the whole world is going to hell in a handbag. It’s like global warming, except instead of new beach front property, all we get is rising blood pressure and an increased desire to run away and live in a shack in the Montana wilderness. Still, when life hands you lemons, the only thing to do is try reselling them at a reasonable profit to those who don’t have any citrus of their own. With all new commentary, corrected for spelling and grammar, and jam packed with the snark and sarcasm that you’ve come to know and love, WAJTW: 2013 commiserates over the year that was and looks forward to the inevitable annoyances of the one to come.